20-Nov-1999 -- If you enjoy hiking, mountain biking, golf, or frisbee, then this confluence has something for you. The confluence is located in a forested area of Santa Cruz's De Laveaga Park, close to the golf course. (A frisbee golf course is also located nearby.) 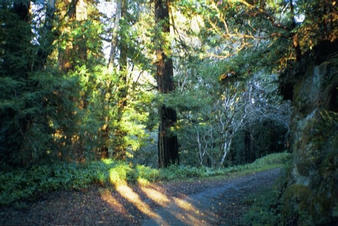 The trails in this area are popular with hikers and mountain bikers. This confluence (which has been recorded before) is sure to be visited many more times in the future. #1: The forested area surrounding the confluence. #2: GPS display at the confluence. #3: Deer walking across the nearby golf course.